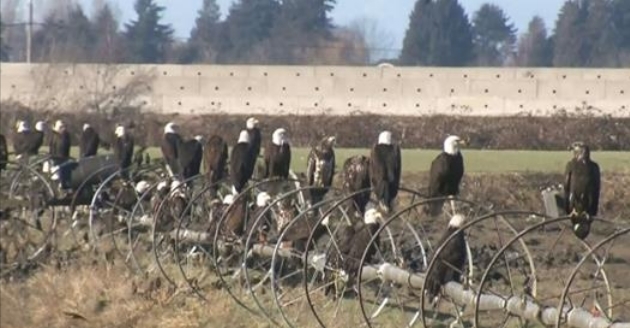 Hundreds of bald eagles have been spotted at a South Delta farm and the birds don’t plan on leaving anytime soon. “They have been here since mid-December and they will (stay) probably until the beginning of May,” Rob Hope, the raptor care manager at Orphaned Wildlife Rehabilitation Society. A nearby organics transfer station is the reason that the eagles have settled on the farm. Seagulls are gathering the scraps and the eagles have caught on. “So the eagles are either stealing the meat from the seagulls or killing the seagulls and eating them,” said Hope. Another factor for the large eagle population is due to the rising river levels in October and November in salmon spawning streams. The hundreds of eagles have caught the attention of many birdwatchers but Hope stresses that people should stay off the road and respect private property. The best way to view the birds is probably by zooming in on your camera or using binoculars. Responses to " Hundreds of Bald Eagles Gather on South Delta farm"
Beautiful photos. It would be helpful to readers if your story mentioned the city and state where the refuge is located.